In a look back at the past month, the average days on market has continued to creep up, rising from 49 to 53. 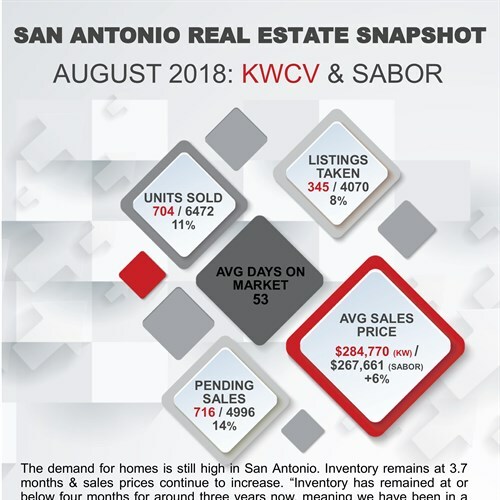 Given the back-to-school rush, Labor Day Weekend, and the heavy rains in San Antonio this month, all of which drive low showing turnouts in properties for sale, we expect the same to continue this month as well. The number of new homes coming on market decreased by about 200 this past month, continuing the trend of low inventory for our city. We currently have less than 4 months of inventory, which means that if everyone who is currently shopping for a home purchased one, we would have no homes left on the market within 4 months. It will be interesting to see how new construction options continue to respond to this inventory challenge, particularly in the first time home buyer market in our city. The average price point throughout the city rose from $261,889 to $267,661, which is in line with recent summer trends where prices rise throughout the busy summer months. Low inventory, sustained housing prices, and rising interest rates continue to make this housing market a challenge for home buyers. To help with this situation, our team has been actively prospecting for potential sellers to help make optimal buyer-seller matches, taking the stress out of the transaction for both sides. We look for homes in neighborhoods where our upcoming buyers are looking to purchase, and we prospect in advance to find homes that might be a good match. This makes for a less stressful selling situation for the sellers, too, as they know that they don’t have to worry about keeping their home show-ready while it waits to find a buyer on market. If you know of someone who is considering selling, please send them our way and we can help identify their unique selling proposition for their house and how to best market the property for them. If you are looking for a good deal as a homebuyer, know that not every home is currently selling within a few days on market. There are neighborhoods and homes that need some improvements, but mostly cosmetic, that our team can help you identify that aren’t necessarily obvious deals from the outset. If you fall in this category, let us know, as we always have at least a few good options we’ve identified where you can get some great bang for your buck. Where to Brunch Around San Antonio?